In “The Happiness Project” by Gretchen Rubin, Gretchen decides that she wants to be happier. It’s not that Getchen was unhappy in her life. It’s more that she thought she should be happier. She had a great husband and great kids. She had money and her career was on track. So why was she wasting her years kvetching and grumping at the people around her? Gretchen decided to embark on The Happiness Project. Gretchen is an ex-law clerk for Supreme Court Justice Sandra Day O’Connor and she has a very organized, legalistic mind. She makes a calendar of goals and embarks on a year of increasing her happiness. The Happiness Project fascinates me. 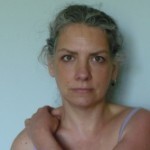 Gretchen’s story brings up a number of questions which have teased me for years. What are reasonable expectations for happiness? How committed are we really to being happy? And how much of happiness is our circumstances, and how much is our attitude? Gretchen begins by finding 11 key areas in her life which she wants to improve–marriage, parenthood, friends, eternity, attitude, work, play, passion, energy, money and mindfulness. If I made my own list, my “Things to Work on to Increase Happiness” list would be: health, spirituality, time to do nothing, creativity, connection with friends, adventure, beautifying my environment, family, prosperity, clothes, nature and love. What’s your list? What 11 things would you make a commitment to improve if you knew you’d be happier at the end? Gretchen took her 11 areas to improve and assigned each of them a month in the next year. Each month she set specific goals to improve these areas. When the new month came, she added to her list until finally, by the 12th month, she was working on the whole picture. But how crazy is that? Why won’t I commit to myself to work in the areas that I already know would help me be more happy? Even if I’m not more happy at the end of the year, I know I won’t be less happy for working on them. In my own little mini-Happiness Project, I have been jogging for the last 3 days. This is a minor victory, not only because 3 days is a short time but also because I used to be much more athletic. But still, I have run 3 days more than I ran the week before. I’m counting it. I am committed to living a life of abundance and beauty and ease and connection. My commitment must extend farther than just ideas–I need action. What are your key areas to improve to create an environment fertile for Happiness? And how committed are you to them? All around us, people are coping with stress–our friends, our family, our co-workers–even our children. But what is stress? And what about stress debilitates us so much? As mothers, we are particularly susceptible to stress because of the many and varied responsibilities we carry. As I write this, I am trying to build a website, monitoring the kid’s homeschooling, planning what clothes they need for winter, preparing myself for my next client, ignoring my dirty house, making sure we have what we need for dinner, mediating my children, and, to top it off, today I am trying to plan a yoga class so I can relax. Am I prone to stress? You bet. The term stress is used popularly to describe two different things. The first definition of stress is the events, environments or stimulus which we perceive as endangering us and which cause us to react. These can more accurately be called “stressors”. The second use of the word stress is about our bodies’ and minds’ reaction to the stressors, and can more accurately be called “stress reaction”. The distinction between stressors and stress reaction is important because we are always surrounded by stressors, yet we don’t always go into a stress reaction. Once we recognize this, we can begin to manage our bodies’ stress reactions. Most of the time, we recognize stress by our outer symptoms–headaches, sore muscles, irritability. It’s important to understand that these symptoms are not the only results of stress, but are, in some cases, the least significant effects of stress. Constant, unabated and chronic stress is a lead player in our modern melée of disease. Diabetes, heart disease, irritable bowel syndrome, psoriasis, and colds all can result from chronic stress. And while stress may not cause many other diseases, it can set the stage for inflammation which can then cause disease. Stress forms a partnership with many factors of our modern life (poor nutrition, lack of exercise and toxic overload) which leads to chronic disease and conditions which we now view as inevitable or expected. Your physical body is not the only victim of stress. When our bodies are under stress, the chemistry changes and this can so deeply affect us that we can not control our emotions any more than a pregnant woman can keep from bursting into tears. Our bucket is full. One extra drop and we spill over, wetting everything and everyone around us. When chronic stress takes its toll, our health, our jobs, our relationships and our sanity are at risk. Chronic Stress: Chronic stress results from bodies ill-adapted to modern sustained stress environments. Stress Cycles: Stress cycles around and around, creating more sensitivity to stressors and therefore increasing our stress. 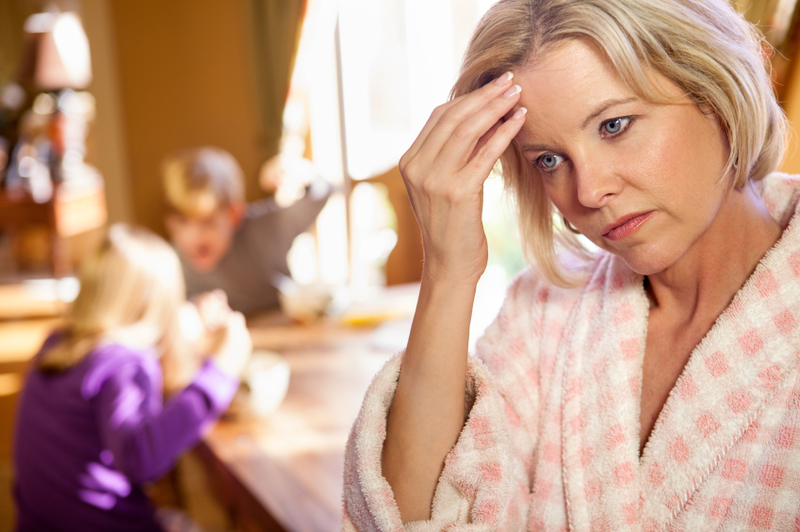 Stressed Moms: Stressed moms have unique challenges to begin to relax. Why is it so hard to take time to slow down? Of the ways to use essential oils to relieve stress, internal use offers some of the most profound effects, and yet it is the least recognized. Find out how to ingest essential oils in a safe, effective way. There are three main methods of using essential oils to relieve stress: topically, by inhalation and by ingestion. In this final part of our series, we will learn about how to safely use essential oils internally. Among the ways to use essential oils, the least understood is internal use. Yet, when used properly internal use offers potent therapeutic benefits. The essential oils of the plants can support our organ systems, and balance our metabolism. Using the oils internally offers a way to increase the potency of the oils. And all of this is great if you are working to prevent or reverse the harms of chronic stress. 1. What essential oils are safe to use internally? 2. How do you find quality essential oils? 3. How do you use essential oils internally? 4. Which oils should I use internally? 5. When do I use essential oils internally? 6. What are the advantages of taking essential oils internally? 7. What precautions should I take with internal essential oil use? There are two main considerations when choosing an oil to use internally. First, you must check if a particular essential oil is certified as GRAS (Generally Regarded as Safe) by the FDA. If the oil is on this list, it will be safe to be used internally. The second, and equally important consideration is the quality of the oil. Most essential oils, even the ones at health food stores and especially the ones at a bath and body shop, are made for the perfume industry. They can be adulterated with many chemicals to extend the oil or alter the scent. Even the term “natural” has no official meaning and may not guarantee the oil’s purity. –Is the oil genuine? Is it 100% natural (no synthetic additives)? Is it 100% pure (no similar essential oils added)? Is it 100% complete (not decolorized, recolored or deterpenated)? –Is the oil authentic? Is the oil from the specific species listed on the label? The best essential oils for internal use are from small production facilities who carefully produce their oils with a vision of aromatic healing. Each batch should be processed slowly, carefully and at low temperatures. And each batch, like a fine wine, will reflect the particulars of that harvest. The best oils will very in small ways from year to year. The quality and purity of essential oils are important because they assure that you get the true benefits of essential oils, that you are not ingesting chemicals and that you are assured a predictable action from the oil. Only use essential oils you trust. The quality on any particular oil is difficult to assess, even to aromatherapists. Using spectrometers, companies can make sure their oil supply is pure on a gross level, but many chemicals can be added to an essential oil so that the spectrometer results mimic a pure oil. The best way to find quality essential oils is to find a supplier you trust, and let them make the assessment. Ask questions about the oils–what do their labels “pure” or “natural” really mean? Do they know the farmers who raise their crops? Do they use low temperature distillation? Find a company which takes pride in the therapeutic value of their essential oils. There are many ways to use essential oils internally. –You can add a drop of oil to a glass of water or a teaspoon of honey. For example, a drop of lemon will make your water taste great. A drop of peppermint will taste good and ease stomach upset. Be prepared for a flavor blast! –If the flavor is too strong, you can put a couple drops in a gelatin capsule and take that. Start with only a 2-4 drops until you know how your body will react. –For those who enjoy the strong flavors, you can put a drop directly under your tongue. I use this with Thieves blend as a cold preventative. Peppermint will freshen your breath. –And finally, one of the fun ways to use essential oils to really take advantage of the essential oil flavors is to cook with them. Some of the healing properties may be lost with the heat of cooking, but the flavor will be fantastic. Add oregano or basil to your tomato sauce. Add black pepper to your salsa (this is really good). Add lemon to your home-made lemonade and decrease the sugar. The lemon will make a tasty drink the kids will love. For certain conditions, the French have other ways to use essential oils. They will sometimes use essential oils rectally or vaginally. Suppositories are especially effective for lung conditions because the oils are absorbed by the rectal veins and by-pass the liver on the way to the heart-lung circulatory tract. Longevity blend. Longevity is absolutely one of my favorite oil blends and I use it regularly to counteract the effects of stress. It is a very strong anti-oxidant, which helps your body repair the wear and tear of stress. It also contains oils which contain anti-tumural properties, support immune function, decrease the stickiness of blood cells and prevent degradation of fats in brain, heart, liver and kidneys. This blend comes in a capsule form, so it is one of the easiest ways to use essential oils internally. The capsule is designed to dissolve in the intestines to maximize the absorption of the oils. Take Longevity daily to tonify your body, and balance your metabolism, counteracting the damage from stress. Thieves blend. This is a great blend when your immune system is run-down because it is extremely anti-microbial.Take a drop or two under your tongue or in a capsule when you feel a cold coming on. It may prevent a cold or lessen its effects. One winter my family joined my friend’s family in a cabin in northern Wisconsin. Nine of us were in close quarters for 4 days as my friend’s son came down with a cold which eventually became pneumonia. Only my friend and I took Thieves during those days, and only we stayed well. The other seven people all got sick. Thieves worked great for us. Lemon. I use lemon to flavor my water so that I can drink my daily requirement. I avoid sugary drinks and keep my water intake high. Grapefruit. I put grapefruit in my water when I want to curb my chocolate cravings (which, of course, escalate under stress). When my chocolate cravings becoming too consuming, I reach for the grapefruit instead. Peppermint. If anxiety has your stomach churning, try a drop of peppermint in your water to sooth and calm your digestion. Using essential oils therapeutically delivers potent healing directly into your body. Anytime you need major physical support , you can take essential oils internally. There are two philosophical ways I use essential oils internally. Some oils I use regularly for health maintenance. For example, I regularly take Longevity or drink grapefruit. Other oils I only use as relief for a specific health crisis. I don’t hesitate to take Thieves if I’m getting sick. And if I had a major disease, I would absolutely use essential oils as a part of my health plan. Whether essential oils are used internally, topically or by inhalation, the healing properties of the oils will enter your body. There is some debate about which of the ways to use essential oils is most effective, however. When using essential oils internally, digestive juices of the stomach may alter the effectiveness of the oil. However, the same could be said about the oils penetrating the skin when used topically. In general, for emotional issues, I would inhale the oils as my first action, and then use them topically. For physical complaints, I would use them primarily either topically or internally. For a major disease or health crisis, I would use them all three ways. It is important to remember, however, that no matter how you use the oils, you will be getting the health benefits from them. Do what is best for you, your body and your comfort level. Experiment. See what works and what doesn’t. Make sure your oils are GRAS. At first, use only a drop or two. Later when you know how your body reacts, you may wish to increase it. Use common sense–essential oils are very potent. Do not drink a bottle! This would seem obvious, but remember, anything in large doses is bad for you. If you have very young children, keep the bottle in a safe location, just like you do for any remedy. Epileptics and people with high blood pressure should consult with their doctor. They should use caution with high ketone oils like basil, rosemary, sage and tansy (tansy is not on the GRAS list anyway). Pregnant women should consult with their doctor. They should avoid sage, fennel, and hyssop. Do not give essential oils internally to children under 6. This completes our series of using essential oils to relieve stress. Essential oils are one of the best tools for a stressed mother. She can regain her sanity while enjoying the prescription for her health. Your trapezius muscles are some of the first to bother you when you are under stress. They ache and burn from the base of your skull to between your shoulder blades. The good news is that they are relatively easy to massage. When we are under stress, one of the first muscles to cause us pain is our trap muscles, and part of that reason is because of the nifty role they play in our movement. 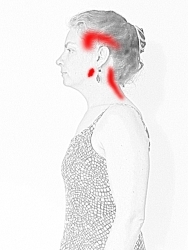 If you are in pain now, skip to the “How to Massage your Trapezius” section. If you want tips on relieving trapezius muscle pain through better movement and posture, go to Trapezius Exercises. The trap muscles are the only muscles which can lift the outside of your shoulders to create a “shrug”. 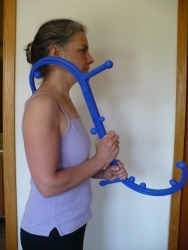 They move the head and neck toward the shoulder of the other side. The middle of the muscles pull the shoulder blades together, while the lower draw the shoulder blades downward. They support the weight of the arms. Often these movements are at play when we are under stress, and doing the activities that cause stress. Where do Trapezius Muscles cause Pain? Trap pain is classic stress pain. 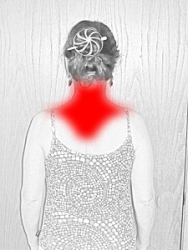 Your shoulders ache, your neck hurts and it is often deep and achy. You may have a headache, especially in the temples or behind your eyes or at the base of your skull. You may feel burning between your shoulder blades after sitting at your computer without elbow support. What causes Trapezius Muscle Pain? Stress. Stress. Stress. Relax those shoulders!One of the first, primary causes of trapezius strain is carrying your shoulders up near your ears. Remember to relax your shoulders. Head forward posture. Often people, particularly people in the west, people in charge, forward-thinking people, or people who are planning/worrying about the future stand and sit with a head forward position. Remember to sit up straight, lower your shoulders and bring your head back. This relieves strain on the trapezius. You can also try some online yoga to improve your posture. Holding a phone between your ear and shoulder. Get a headset. Carrying a heavy purse or backpack. Ask yourself if everything you have is really necessary. Switch your purse from one shoulder to the next frequently. Carry your important stuff in a fanny pack. And don’t forget to do your stretches. Bra straps that are too tight or the weight of heavy breasts pulling on your straps. Have your bra fit by a person trained to get a good fit. And remember to do your trap stretches. Breastfeeding a baby with your shoulders hunched forward and the weight of the baby in your arms can cause trapezius muscle pain. Check your posture and bring your shoulders back. Do side-lying whenever possible. Support the baby on a pillow on your lap. Remind yourself to take a small break from gazing at your sweetie once in a while, to bring your head up and relax your shoulders. Sleeping on your back or stomach with your head turned to one side. Change your sleeping position (easier said than done). Any position where you head is turned to one side for a long time. Are you a teacher and you turn to look at the student next to you? Do you turn to see your computer screen? Bending forward while working. Do you bend forward to work at a sewing machine or look down at your knitting? Do you bend forward when you type at the computer? Do you do beading? Sit up! Too high keyboard. Get a keyboard shelf for your desk. Working with no arm rests and the weight of your arms hang from your shoulders. Get a chair with arm rests. Put your hands in your pockets if you are standing for a long time. Support your arms to prevent trapezius muscle pain. Whip lash. This just takes recovery time. Playing violin, piano, backpacking, bike riding, or other activities which heavily rely on the trapezius muscles. Remember to stretch. Watch your posture. Take a break when you need your trap muscles to recover. You can prevent and relieve pain in your trapezius muscles by exercising them. Exercise brings circulation to the muscles, and it relaxes them. Most importantly, if done correctly exercise will strengthen supporting muscles that support good posture. You can relieve a lot of muscle strain by using many muscles groups in a relaxed with, without overworking your traps. My Yoga (affiliate link) is an excellent way to get instruction on using your back correctly. They offer classes in Pilates, Yoga, and Meditation. For more information on how My Yoga Online works, go to Online Yoga Workout with My Yoga Online. It’s easy to find your trapezius muscles. The top of your trapezius muscle is one of the most common locations for shoulder tension. 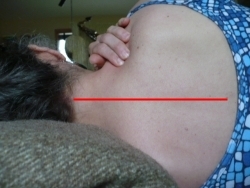 This is the most likely place someone will massage you when they give you a neck massage, and it often needs it. It can be tender and sore and have spots which “hurt so good” to be pressed. It is not hard to find knots and ropes in this muscle. 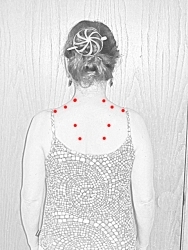 When you press on any of the areas shown in red, you are likely to find a tender area. Apply firm but gentle pressure for 10-30 seconds. Sometimes you will feel the muscle relax under your fingers. These areas can be difficult to reach if you are trying to massage your own back. Here are some tricks to get to the sore spots! 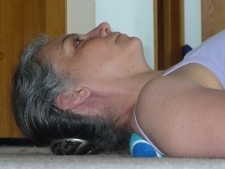 When you lie down, your trapezius muscle relaxes because it doesn’t need to hold the weight of your arms. Be sure to use a pillow that keeps your neck exactly in line with your spine, otherwise the trap may get stressed in this position. Once you are lying down, just knead your muscles and press on any sore spots. 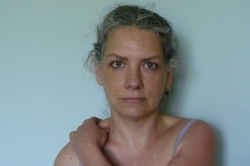 Place a tennis ball (or hard rubber ball) under your trapezius one of the tender areas and lie on it. You can control the location and pressure by moving your body. Another nice way to reach your trap muscles is to use the tennis ball against a door frame. This looks more awkward than it feels. 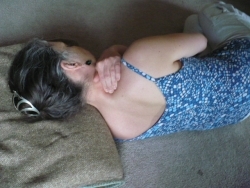 It is really a very nice way to massage the tops of your shoulders. 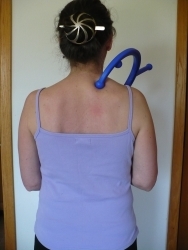 The Body Back Buddy is a handy tool which can help you reach many unreachable pressure points. You can use it easily on any of the areas of trapezius muscle pain. I also recommend online yoga classes to help correct your posture, stretch your muscles and relieve your back pain.